Today I layered a striped button down shirt under a navy blue shift dress. Instead of pairing this combination with a classic navy blue blazer I decided to add a scarf print option to add visual interest. I accessorized by wearing two necklaces on top of each other to create one chic statement piece. 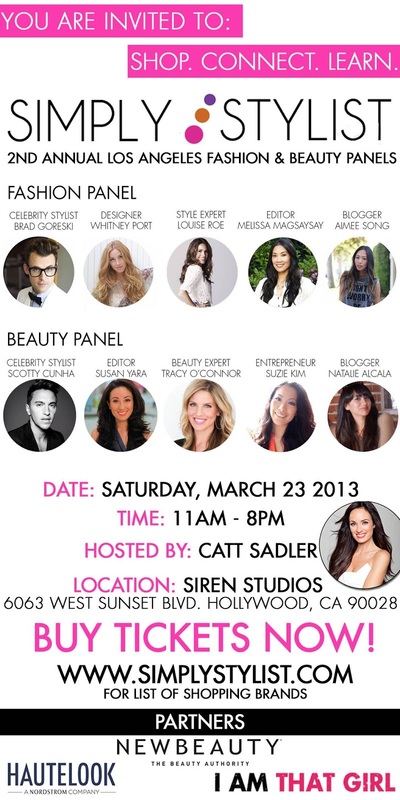 Also, I’m so excited to share with you a great event taking place in Los Angeles this Saturday. I attended last year (see post here) and it was a day filled with networking, fabulous guest speakers, and great girl talk! I will be covering it this year and I would love to meet you there! you look amazing in this outfit! actually all your outfit are so stunning snd dophisticated. Thank you for the lovely comment on my blog, maybe we can follow each other too. I'm glad your posts are updated in Blovin again. I really live this outfit. I'm glad your posts have been updated on Bloglovin, love this pairing-everything about it. Mol, I'm not sure why they weren't updated in bloglovin' before. I'll have to look into that. Thanks so much for stopping by, ladies! Love the print of that blazer. So different. And I love the layering of the shirt under the dress. I need to try that. I loooove this blazer and the whole outfit is simply stylish. And also wish to you, Happy Monday!